Those of us above a certain age (I.e.me) will have a soft spot for the feature film version of Willy Russell‘s ‘Shirley Valentine‘: a warm, comforting hug of a film. I was fascinated to see how the original play would compare and I was not disappointed. The writing still shines, Shirley’s tale of drudgery turned enlightenment still chimes and the accessible humour of Russell’s writing has a broad appeal. 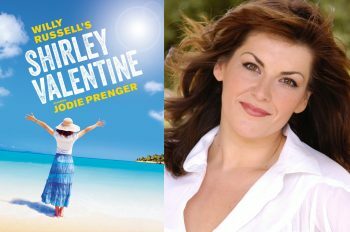 Jodie Prenger gets the auspicious opportunity to make these words her own in a new production directed by Glen Walford and, for the most part, does a great job. There is something uniquely thrilling about seeing fresh egg and chips cooked live as an actress performs stanzas of text, and I would have gladly gobbled up Prenger’s slightly anaemic looking chips! The design of the show by Amy Yardley really is a game of two halves, with the Act I very much an authentic eighties kitchen. Act II’s Greek island leaves a little to be desired, with the most artificial looking rocks I’ve ever seen! Shirley’s journey from dowdy to divine is a joy to behold and her voyage to her very own paradise is bittersweet: so much time wasted and life un-lived – Prenger captures this pathos well. Shirley is something of an everyday poet though and I would have loved her to have luxuriated a little more in this rich text, for her and Walford to have been brave enough to slow down, to breathe, to allow more time for pause and reflection. Ultimately Shirley discovers herself again: I wish she, and we, were given a little more time to do so.